Dentists often tell their patients that a healthy mouth is the gateway to a healthy body and that poor oral health often leads to poor physical health in the body. This is why it’s so important to Dr. Q at Dr. Q Dental in Monrovia, California, to keep her patients informed as to the best ways to maintain optimal dental health and thus protect their overall health from diseases and conditions that may be encouraged or caused by problems in the teeth and gums. 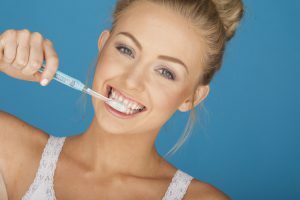 Among the many recommendations that Dr. Q provides for her patients in Monrovia, California, here is a list of her top 5 tips to help patients improve their dental health, increasing the likelihood of maintaining healthy, natural smiles for life, as well as contributing to their overall health and wellness. This point cannot be stressed enough. As with nearly every health condition, early detection and intervention plays a critical role in the prevention and successful treatment of such undesirable oral conditions as tooth decay, gum disease, gingivitis, and periodontitis, which may affect a patient’s overall health and well-being. A healthy and balanced diet, rich in fresh raw fruits and vegetables, lean meats, whole grains, and healthy snacks such as raw or fresh-roasted nuts and seeds, not only provides you with a healthy body but will also contribute to a healthy and radiant smile, and strong, healthy teeth to last you a lifetime. Brushing and flossing are the keys to maintaining a mouth free of harmful oral bacteria, preventing the build-up of plaque, and discouraging the development of tooth decay and diseases affecting the gums and bone. This healthy habit also helps to prevent and treat bad breath while keeping your smile healthy and attractive. Be sure to use a soft brush to thoroughly clean every surface of each tooth, as well as flossing carefully between each tooth, clearing out debris and plaque that may accumulate in the crevices between teeth. Rinsing after every meal helps wash away debris and food particles that may build-up in the mouth after eating, helping to maintain a clean and healthy environment that’s free of harmful oral bacteria which can lead to tooth decay and gum disease. Many dentists recommend the use of dental picks, gum stimulators, brush picks, and other portable devices to help you maintain a clean mouth, clearing away food debris that accumulates between the teeth when brushing after meals is not a viable option. If you live in Monrovia or neighboring communities in California and want to improve your dental health, contact Dr. Q Dental at (626) 599-9819 to schedule an appointment with Dr. Q and learn more about how to protect the health of your teeth and gums.